Hypothalamus is a small but important part of the brain and plays an important role in hormone production and helps to stimulate many important processes in the body. The word hypothalamus comes from two Greek words that translate to “under thalamus.” This is exactly where the hypothalamus is located in the brain, underneath the thalamus and above the pituitary gland. Hypothalamus is responsible for certain metabolic processes and other activities of the autonomic nervous system. It synthesizes and secretes certain neurohormones, called releasing hormones or hypothalamic hormones, and these in turn stimulate or inhibit the secretion of pituitary hormones. The hypothalamus controls body temperature, hunger, and important aspects of parenting and attachment behaviours, thirst, fatigue, sleep, and circadian rhythms. Hypothalamus is a part of brain. More specifically, it is a part of limbic system. 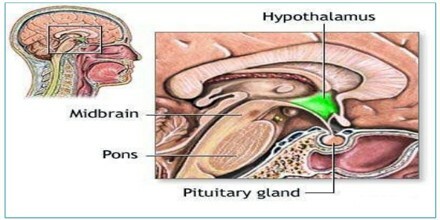 The hypothalamus and pituitary gland are connected by both nervous and chemical pathways. The posterior portion of the hypothalamus, called the median eminence, contains the nerve endings of many neurosecretory cells, which run down through the infundibular stalk into the pituitary gland. 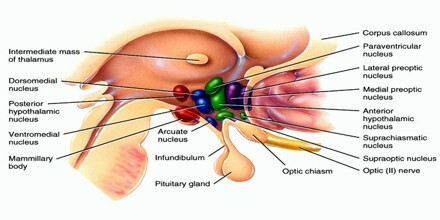 Important structures adjacent to the median eminence of the hypothalamus include the mammillary bodies, the third ventricle, and the optic chiasm. 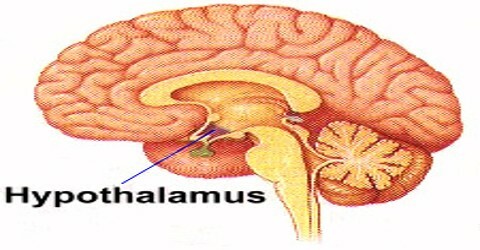 Above the hypothalamus is the thalamus. 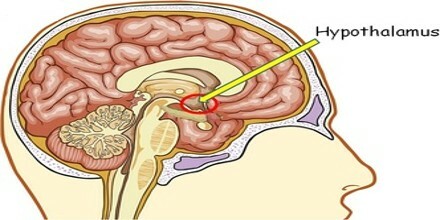 Damage to the anterior hypothalamus blocks the production of ADH. This leads to a condition where the kidney fails to conserve water and the condition is called diabetes insipidus. CRH is released by the paraventricular nuclei and taken up by the portal system where it has action on the anterior lobe of the pituitary. There are connections with the eye and the brain. The connections between the retina to the suprachiasmatic nucleus deals with the synchronization of the daily rhythms also known as circadian rhythms. Any lesion or disease of the hypothalamus thus affects the sleep-waking cycle. Both the input and output fibers are present in hypothalamus. It is connected with cerebral cortex, brain stem and also with other limbic structures via these input and output fibers or tracts. Injuries or diseases affecting the hypothalamus may produce symptoms of pituitary dysfunction or diabetes insipidus; in the latter disorder, the absence of vasopressin, which promotes the reabsorption of water in the kidneys, induces the rapid loss of water from the body through frequent urination. Hypothalamic disease can also cause insomnia and fluctuations in body temperature. In addition, the optic chiasm is particularly susceptible to pressure from expanding tumours or inflammatory masses in the hypothalamus or the pituitary gland. Pressure on the optic chiasm can result in visual defects or even blindness.